“Touched with Fire”: A poignant drama starring Katie Holmes and Luke Kirby as bipolar poets in love. 3 stars out of 4. There’s something terribly, painfully poignant about “Touched with Fire,” one of those little under-the-radar movies that’s much better than you think it might be. 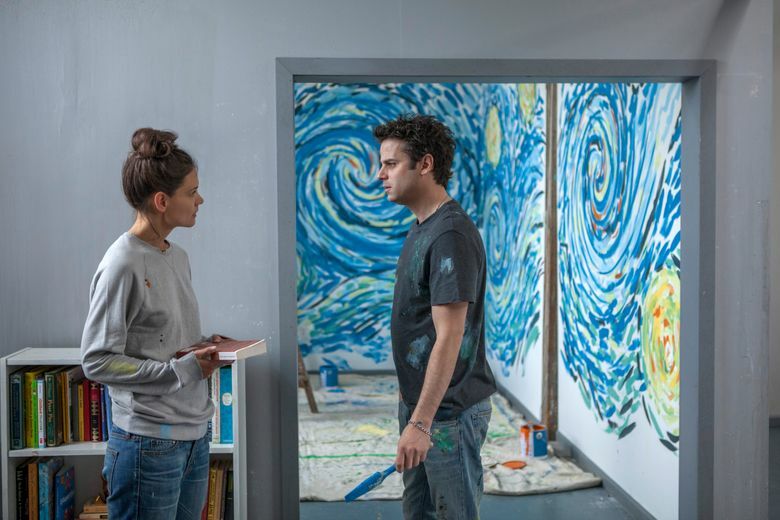 Its plot summary — two bipolar poets fall in love — sounds like an indie-movie cliché, and the star power of its central couple (Katie Holmes, Luke Kirby) seems potentially lackluster. But writer/director Paul Dalio, who based the film (his directing debut) on his own struggles with bipolar disorder, establishes a gentle, honest tone that never wavers — and demonstrates a knack for vivid imagery that makes him a filmmaker to watch. Exploring the intertwining of bipolar disorder and creative genius (its final frames show us the names of dozens of great artists, writers and musicians believed to have been bipolar), “Touched with Fire” flits in and out of reality and fantasy. We see Carla and Marco whirling blissfully in a Van Gogh “Starry Night” painting, as sequin snowflakes fall — and screaming uncontrollably, lost in a dark fog of mania. Some of the images (filmed by cinematographer Kristina Nikolova), such as dreams that look like black ink swirling through water, are mesmerizing, as is the aching, weary sadness in Kirby’s and especially Holmes’ performances. ‘Touched with Fire,’ with Katie Holmes, Luke Kirby, Griffin Dunne, Bruce Altman, Christine Lahti. Written and directed by Paul Dalio. 104 minutes. Rated R for language, a disturbing image, brief sexuality and drug use. Several theaters. You leave “Touched with Fire” wishing there were a little more to it — the screenplay needed to flesh out Carla and Marco a bit more as people, rather than Bipolar Poets in Love — but undeniably moved.